It's been 20 years since the White House invited the neighbors from the north to dinner. On Thursday, Barack Obama is rolling out the red carpet for newly elected Canadian Prime Minister Justin Trudeau and his wife, who will be America's guests of honor at a swanky dinner. This may be Obama's final state dinner and Canada has been last on the list. Since 2009, he has invited China twice and Mexico, India, Germany, the United Kingdom, France and Japan. But relations with the northern neighbor have been frosty since the Bush regime because of Iraq, then the Obama presidency because of Keystone pipeline. All that changed in November. Trudeau was elected, Obama called to say Keystone would not be approved and Trudeau's reaction was disappointment, not anger, despite the economic damage. Weeks later, the invitation was in the mail. Canadian politicians have little or no influence on US policy, but the country does, indirectly. The best example is the new and growing "socialist" movement led by Bernie Sanders whose ideas are straight out of the Canadian policy playbook. These include a single-payer universal healthcare system, higher minimum wages, low university tuition and a more nuanced foreign policy. With other liberals, Sanders opposed the Iraq invasion in 2003. Canada refused to participate. In hindsight, all were correct in doing so. Sanders' policy alignment with Canada is regional. He has lived for decades in Burlington, Vermont, a city that is a one-hour drive from the border and where people also watch hockey, recycle and apologize to machinery when they bump into it. American border states are more liberal-minded. Obama is a fan of Canada's social democratic traditions, and on his first foreign state visit to Canada in 2009 told ecstatic crowds simply: "I love this country." Ever since, Canada has loved him back and he has sometimes been more popular in polling among Canadians than have Canadian leaders. Even so, Canada is sideswiped. In 2009, a requirement that US citizens needed passports to re-enter from Canada to the US seriously lowered American tourism to Canada. The country lobbied fiercely against losing this time-worn privilege but was ignored. The relationship will always be asymmetrical and was best described by Trudeau's late father during a state visit in 1969 with Richard Nixon. "Living with you is in some ways like sleeping with an elephant: no matter how friendly and even-tempered the beast, if I may call it that, one is affected by every twitch and grunt." This week the elephant is reaching out to reconstitute the relationship and burnish the presidential brand as Obama's tenure draws to a close. "I think there is a developing special relationship between this president and prime minister," said Mark Feierstein, senior director for Western Hemisphere at the National Security Council in an interview this week. "Both are young leaders with similar visions, both have a progressive vision of governing, both are very much committed to the appropriate use of multilateral tools, both are committed to diversity." 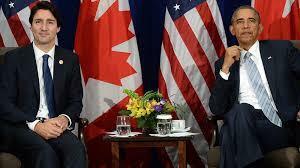 At the moment, this is a match made in heaven: a grateful president honoring a policy soul mate in Canada. They align on climate change prescriptions and Trudeau's signature policies - such as his pledge to legalize marijuana and absorb up to 50,000 Syrian refugees - resonate with American liberals. For Canadians, the attention is welcome, because they have never felt the love. Trudeau referred to this grievance when he chided Americans in a television interview for not paying enough attention to the world, then tentatively added: "I think we sometimes like to think that, you know, Americans will pay attention to us from time to time, too." This week's events are about fence-mending, but the future is uncertain. There will be fence building if Trump wins and builds a wall in the north, then hands Canada the invoice. He's also said he would approve Keystone but only if Americans make all the profits. As New England poet Robert Frost famously said: "Good fences, good neighbors make." That can be true, but it depends on the kind of fence. And sometimes you want your neighbor to make friendly conversation with you, not just twitch and grunt.